Hi folks, I'm done with the first version (Edit: the latest version is now actually 1.3). It's called RACK PLANNER (not to be confused with MODULAR PLANNER, which is the web based tool you all know and love. Great thanks go to user modularplanner for all the work he did (and does) on that wonderful web based tool). 1) A single big window (scrollable) with an infinitely large workspace and a menu at the top. 2) Configuration save and load, stored as xml. 3) Modules stored on disk as zip files containing jpg, details in xml. Make your own modules if you want. 5) Written in Java with local version (not web based). 7) Free. No donations, no guilt. 9) Should work with any format (non euro) and any rack. 10) Full rack capture to jpg. 11) Module copy and paste. Try it: http://www.hevanet.com/dougcl/rp/RackPlanner.zip It's freeware. Will the image size be the same? In a perfect world I'd love to see a 15% - 20% increase in resolution of the modules compared to the "old" planner. 1) Got the main JFrame class started the scroll pane in place, the rack class started with background tile, the module class started with module image, concept of HP implemented, and module location in pixels and row/col. 2)I've got the module image scaled automatically from arbitrarily large or small source images (jpg/gif, others) from disk, based on the indicated module HP alone. 3) Decided to make the rack 16 rows by 16 racks wide modeled after Bakis' system (I guess this is actually double that), although this is just an arbitrary starting point. It will be easily configurable. Module movement with arrow keys. Module movement with mouse with snap to grid. Module factory class, and finally file I/O. Might be done this weekend. This first cut will be pretty basic. Just as a reminder, this will be absolutely free, open source, no obligation, no donations required or requested ever. Modules will be easily built by anyone who can make a jpg/gif, a simple text file and a zip file. Hopefully this will result in a large number of user created modules in a library we can all share. Code is Java, local install (no web). I'm a little concerned with how to protect this using the GNU public license, so if anyone has any experience with that, please let me know. First of all thanks for your dedication to this project. I've thought about doing my own but have other projects, you know how it is. Since you're going to the trouble to do this new version, here are a couple requests. 1. Don't limit it to a single format. It seems such a waste to limit this to one module format. 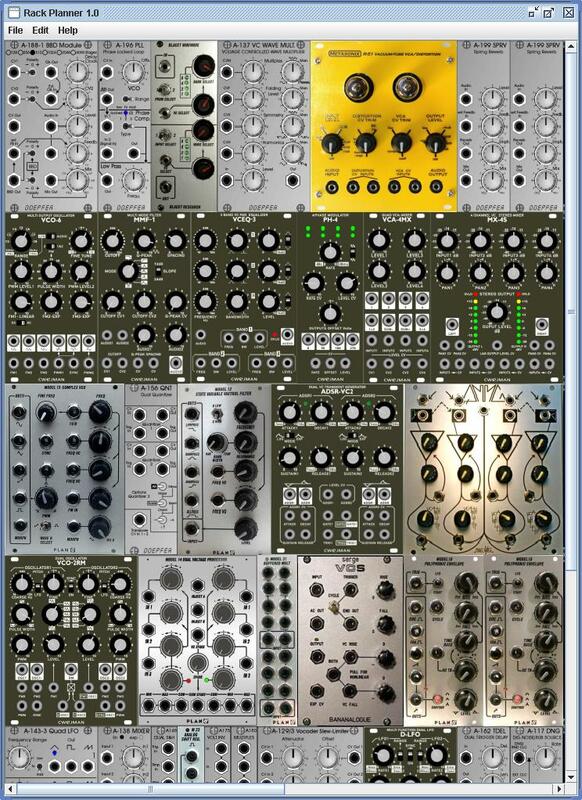 Just as one can select modules, one should be able to select racks to put them in. An XML file defining the height and width etc. for each format would let us add new ones (even oddball DIY stuff). We should be able to arrange an assortment of racks in rows and columns (as in the real world). A general purpose "container" object could be inherited by both racks and modules. 2. Definitely use XML or something equally open to hacking rather than jar files. Nothing wrong with Java but some of us use other tools. If some of the module info has to be in jars, give us a utility for making our own (fill in a form, import a picture, whatever's necessary). Maybe an API to go with it. 3. You mentioned once before what a lot of work it is gathering all the images and how it came to be that many of the images are so small/blurry that you can't read the jack labels and such. If you make a decent open file format (and some kind of API/utility if we can't do it all with simple files) I'm sure some of us would be happy to create and share carefully prepared module and rack files. If you want to brainstorm this at a more tedious level of detail, PM me. I've got an idea for a related tool too. 1. Don't limit it to a single format. 2. Definitely use XML or something equally open to hacking rather than jar files. 1) In order to address Andreas' request for scale variability, I think this is going to be pretty much possible, although this project remains primarily for euro. I'll keep this in mind though, and I think we'll get it for free, although mixed formats will not be supported within one config, I don't see this as huge limitation. 2) There are four files planned. a) xml representing the entire configuration, totally hackable (human readible) and will probably have features not present in the GUI to configure the layout b) module jpg/gif, this can be anything as long as the aspect ratio is correct. c) module xml, which will have tags for manufacturer, HP, current draw, module name, etc. Obviously hackable by design, and all parameters will be obvious to everyone d) a module zip (or jar) to hold b&c for each module. 3) this is my primary objective. In my opinion, the euro situation is probably going to become overwhelming if we don't open up the maintenance of the module library to users and manufacturers. I envision a "module" sub directory in which all the module zips reside. The zip names will be important in that they are unique, and hopefully say something about the contents (ie. Doepfer_A-132-2.zip, and Cwejman_VCA4-MX.zip), although the program will not parse the name for information in any way, users will be browsing this directory when adding modules to the rack, so a name like jc12345.zip will not be very helpful, although it would work. All module details come from the module xml file in the module zip. although mixed formats will not be supported within one config, I don't see this as huge limitation. Yes, but I keep thinking that it shouldn't be that hard to do. I know I'm not the only one using more than one format. c) module xml, which will have tags for manufacturer, HP, current draw, module name, etc. Instead of a single "HP" parameter how about "width" and "units" where "HP", "inch" and "mm" are valid unit designations. It just seems weird and error prone to have people specifying modules by Modcan, Blacet, etc. in HP. How about something in the zip file for info about where the file came from? For instance if I made some module zips I could include an author.xml file with contact info, all of it optional. Personally, I'd want to have a URL listed there. People could go to the URL and find a download page for any other module zips I may have made. Of course, I could just put a README text file in the zip but if it was XML you could more easily use the GUI to display the info. You're doing all the work so no hard feelings if you blow off these suggestions. Yes, but I keep thinking that it shouldn't be that hard to do. Keep thinking. Seriously though, I am going with a rack object that is defined as a huge scalable area in a single format. Not going to change this. It's marvellous and very simple. Multiple formats will be supported, but not in one rack. Create separate racks, just like you do in reality. Ah! I thought HP was a universal rack measurement like U. Please confirm. If not, I'll look into this. Should be easy. Otherwise I don't mind making people think in terms of U and HP. How about something in the zip file for info about where the file came from? Keep 'em coming, and no hard feelings if I blow them off! I think this multi format idea will be easy, so I'm really glad you mentioned it! Will the ASys modules have that same offset so that you can never get any other euro module except Cwejman next to one w/o using up 1HP space? Ha ha, NO. I was thinking about that. Okay maybe. No. For Andreas, got scaling working. Scale of 2.0 is shown. Scaling of 1.0 equates to the old modular planner. Scale of .5 is really small but looks good, less than that and the scaler blurs the image into mush. For Banana, Generalized rack and module concepts to admit any format (hopefully). Got module movement with arrow keys. Got focus working so that focused module is bounded in yellow as shown. Lots of cleanup and organizing. Next: mouse movement and snap to grid. Mouse movement (drag and drop) and snap to grid done. This was the big hurdle in the project. I think the rest is down hill. ModuleFactory class, create module zip, and try loading a module from disk. This will pretty much bring us to the capability of the current version (a little more and a little less), and I may release it for review. Construction of module library can begin. You know, now with the new case coming out from PlanB, it would be nice to select the type of case the modules are going into. Well, once they start shipping anyways. The case is infinitely extensible in both directions (note the scroll bars). This will accommodate any eurorack possible. The default will be Bakis' system. Will that work for you? Edit: Oh, and if you want a different width, you just need to create another background image for it. This program should accommodate all if not most of the existing modular formats as well, although I am writing it for euro. Is this thing up yet? I can't seem to access Modular Planner's page. I used to be able to, but I can't now. Even with trying 2 browsers. If your talking about my planner its always up, this planner has nothing do with me. I'm not sure what is causing your problems, are you seeing anything (black page) or just a 404 page not found error, PM me? 1) Get a jpg or gif of the module (any scale is acceptable, but aspect ratio must be correct. 2) Use a text editor to create a simple xml file describing the module. 3) Create a zip file that contains 1&2 and has a nice descriptive name (eg. Doepfer_A-138-2.zip). I can maybe get a rushed version of this out so people can start making modules. That's a heck of a good idea. Do that and I'll take a stab at prepping some Modcan A modules for it. That will be a good test on non-euro capability. Awesome. Looks like there will be a file called background.jpg that will represent one row of your modcan rack. It can be any scale you want, but for now it will appear in the scale you create it. If you want, you can make that now. Make sure the aspect ratio is correct, and the scale is about what you will want to work with. Example module zip is attached. Just got module deletion in. Created the ModuleFactory. Got a working unzip built. I should have something rolling today. I can't figure out why this isn't working for me. Tried Safari and Firefox on OS X Leopard 10.5.6. Latest versions of each browser. It hasn't worked, for me, for weeks. I've laid out most of my system there already. No access now. Works fine here right now, Firefox on latest Leopard... I wonder if your ISP or whatever has some kind of hidden blocklist and the site's accidentally there or something. Regarding the Miniwave, as soon as someone can supply a photo with knobs on ill be happy to add it. Modules can now be added by choosing zip files from disk. See pic at the top of this thread. I've put together three example modules, it takes about 3 minutes to make a module if you have an image available. The MX-4S zip shown in the image is attached. Don, if you want a miniwave, download the zip attached here, have a look. Make one. This program will be available within a few days.